The Linn County Courthouse last week. No surprise here: The Linn County Board of Commissioners wants no part of a proposal introduced in the legislature to pay for a new Willamette River bridge in Salem. 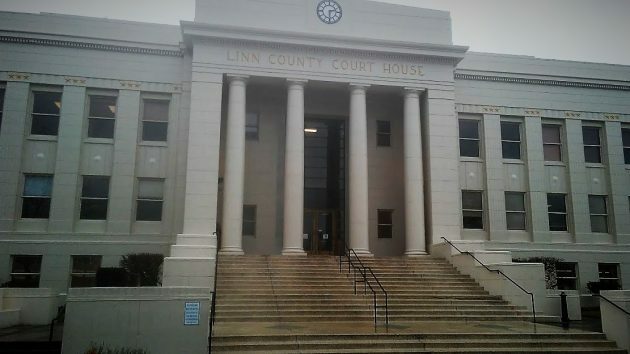 On Tuesday, Linn Commissioners Roger Nyquist, Will Tucker, and John Lindsey voted unanimously to oppose House Bill 2974, which would amend state law to authorize the creation of a bridge district covering Linn, Marion, Polk and Yamhill counties. Rep. Paul Evans, D-Monmouth, introduced the bill after the Salem City Council last week voted 6-3 against pursuing plans for a third highway bridge to across the Willamette between West Salem and the Marion side of the capital city. Last week the Statesman Journal in Salem quoted Rep. Evans to the effect that the bill’s text may be changed to drop Linn County from the “capital city region” and add Benton County. But the language available Tuesday night did not show such a change. A bridge district would be authorized to levy property taxes. The bill says a petition to form the district must include a permanent rate limit for the district’s operating taxes. On Tuesday the legislation was still shown online as unassigned to any committee. Published reports put the estimated cost of a third Salem bridge at $400 million or more. About $6 million, mostly in federal highway funds, has already been spent on the plans. In essence, what Nyquist says is Oregon’s progressive land use laws will prevent construction of another bridge in Salem. Isn’t this the same Nyquist that has railed against the state government for years about liberal overreach? So, Nyquist likes progressive legislation when it suits him, but otherwise, he believes the Liberals “up in Salem” are destroying Oregon. Hmmm….let me see….isn’t this the textbook definition of hypocrisy? Unless you are J. Jacobson. Then you refuse to eat because you don’t want to be accused of hypocrisy. Then you starve and die an “honorable” death. Keep in mind that the text in this bill was not written by Rep. Evans, it was written by the Office of the Legislative Counsel. And their job is, among other things, to analyze and understand the legal ramifications of the legislator’s idea. This means researching statutes, judicial decisions and administrative rules for obvious roadblocks (no pun intended) like land use. If Nyquist is correct, it seems odd that HB 2974 made it this far. Legislative Counsel does NOT originate policy. Legislative Counsel works for the Legislature. Legislators bring their constituents thoughts, together with whatever campaign promises they may have made and together they collaborate with Legislative Counsel to draft constitutionally and legally-sound legislation for consideration and/or modification by the august members of the two Chambers. What passes for policy is the product of politicians mostly concerned with getting re-elected. Please do not blame the attorneys of Legislative Counsel for the shortcomings of the GOPs fortunes in Oregon and in Salem. That’s a GOP problem. The fact that this bill “made it this far” is because once the work’s been done to draft, the bill must be presented, even if only as a “courtesy” to the lead sponsor on the bill. Plenty of statutes have been passed by plenty of legislatures…statutes that went on to be shredded in the State Supreme Court bill-hopper. L – Go back and re-read my comment. I’m not “blaming” anybody. And I certainly did not say the lawyers originate policy. Not sure what you saw in my comment that led you to these erroneous statements. I know this is a rather complex issue so listen carefully. The LC staff (there are multiple levels of reviews & document drafting) is responsible for writing the bill. This happens after meeting with the sponsor(s) and listening to their idea(s). Part of the LC’s responsibility is make sure the bill is legally sufficient, and that includes reviewing other laws to make sure no conflicts exist. Nyquist asserted that this bill would not be approved because it violates land use law. This is odd because if that is the case, then I would expect the LC to have identified the problem. The jury is evidently still out whether this bill will run into conflicts with land use law. Well, no, Nyquist did not say or imply that the bill violates land use law. What he meant, or what I took him to mean, was that Oregon land use law sets up so many hurdles and allows so many objections to big projects on land use issues, that big projects can rarely get done, but that they nevertheless consume tons of money while the process grinds on and the consultants and lawyers earn their living. L- If you have time, read the LC drafting manual. Specifically, para. 5 on page 25. This isn’t a GOP vs. Dem issue. Not sure why you would bring that up. And the government wonders why it is broke?!? Maybe town hall meetings to educate the citizens would have been a good first step. If the problems of traffic on Highway 20 and 34 are swept under the rug in instead of dealing with the issues more people will die.